A lousy movie that was made all because of it’s catchy title, without ever thinking about the need for an interesting story. 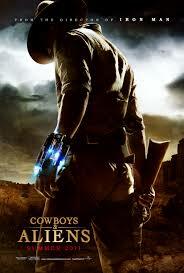 Cowboys and Aliens look like it should be good. First of all, it’s got Harrison Ford and Daniel Craig. Indiana Jones and James Bond. Ford, in particular, is the kind of guy who has been so iconic throughout his career (Han Solo anyone? ), that we are used to seeing just about anything and everything he is in, so long as it’s an action film. I’ve passed on plenty of Harrison Ford romances, but when it comes to action movies, like air force one, what lies beneath, the devil’s own, or anything else, this guy is usually right in his element. Aside from the casting, this movie also has Jon Favreu as a director. Now Favreau is a pretty smart guy when it comes to working behind the camera. He wrote the screenplay for Swingers, before starring in it, and he also directed elf, a modern classic. After that, Favreau decided to try his hand at action and he directed the first two iron man movies. The first Iron Man film, of course, is terrific, but the second one isn’t too bad either. The question is, is they good because of Favreau, or is they good because of Downey Jr.? I’m starting to think it’s the casting more than anything else that makes those movies so great. After all, the first film had not only the perfect actor cast as the hero, but also as the villain, with Jeff bridges coming in and knocking it out of the park. And that probably added up to a major reason why the first film is better than the second. So, yes, Favreau is the director of Cowboys and Aliens, but it is still unproven whether that is a good thing or a bad thing. What is strange, however, are some of the names involved with producing this movie. Steven Spielberg, Ron Howard, and Brain Grazier. Three of the biggest names in Hollywood. And this leads us to why the movie got made. Because of it’s title. Because somebody saw an old comic book with the title Cowboys and Aliens and said, “hey, that sounds like a great idea for a movie, and we’re going to keep that catchy title for It.” since when is a movie made around a title? The last time that happened was snakes on a plane. The big names in Hollywood signed on because they thought this film would bend genres like star wars, but whom are they kidding? Star wars didn’t bend genres. It was total sci-fi, with maybe some western storytelling elements in it. Now to talk about why the movie doesn’t work. Its plot is weak. A guy wakes up and doesn’t remember anything, but has an alien bracelet on his arm. When aliens attack his bracelet shoots them down. Everyone looks at this guy like maybe he’s from another world. That’s about the extent of it. All of that comes out in the trailer for the movie, and all of that is what they really had going for this movie. It’s got that element of mystery, with the character not knowing who he is, but not much more. And the worst thing is that this is just the beginning of the movie. After that, the movie really starts to fall apart with Jake Lonnergan (Craig) and Woodrow Dollarhyde (Ford) joining forces to ride out and hunt these creatures down. But they have no clue where they’re going or what to look for, and so instead they run into Lonnergan’s former gang who now have a grudge against him. There is a bit of a fight and then a chase with the gang pursuing our heroes and that’s when the aliens attack, this time taking apart the gang. In the first half of the movie, we see the aliens only as weird metal ships. They look like dragonflies and are too small to really fit anyone or anything inside. So they have to be remote controlled or something. This movie isn’t interested in giving us answers about these things or even having the discussions. In the second half of the movie, we actually see the aliens, and there’s nothing that creative about them. The arms that come out of their chests are kind of cool in a predator meets Blade 2 sort of way, but other than that, these guys are just ordinary, simple looking creatures. They look fake as hell, running around attacking humans, and by the time this movie turns into total action, aliens vs. people fights, we have lost interest. The movie does make attempts at a half-decent plot, such as a surprise about who the real alien is, and about one of the characters in the group, but even that isn’t followed with any answers. It is just a given, like once we tell you who is an alien, that’s the end of it. What about telling us about these aliens and what they are all about? We want to know where they come from, how they got here, and what they want. None of those questions are answered. 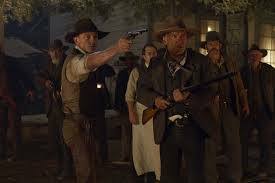 Cowboys and Aliens is a movie that was thrown together like a blindfolded chef trying a tough recipe for the first time. Everyone involved thought the movie would be blending two genres, but nobody stopped to think just how hard that would be. If you want to blend genres, at least make it genres that are similar to each other, like what J.J. Abrahams did with Super 8. He blended the small town mystery with kid’s genre with the giant alien creature genre. Basically he blended E.T. with Clover field. Here, with Cowboys and Aliens, you can’t pick two movies that this is a blend of, because there are none. I do like the ambition involved to get a movie like this made. The people behind it were trying to do something new, and put two genres together that had never been merged before, but a lot more time should have been devoted to the story. We should have gotten at least a scene on board the alien ship, giving us that supernatural sci-fi element like Independence Day or Fire In The Sky did. Cowboys and Aliens is a movie that had eight writers. Three of them came up with the original story and then five others worked out the screenplay. That explains why the movie seems to have no clear vision or path. It might be trying for something new, but it ends up feeling very clichéd and Generic. Doing something new can’t be just taking a cool title and hoping it will translate to the screen. You have to follow the story the whole way through. This movie did a lousy job of that.